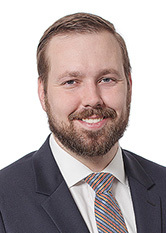 Patrick Messmer is an Associate in the Real Estate Practice Group. He counsels clients on a variety of redevelopment and land use related matters. Mr. Messmer also advises clients on a broad range of real estate transactions, including financing, acquisitions and sales, development, and leasing. Prior to joining the firm, he advised several municipal governing bodies and sewerage authorities on various matters including zoning, redevelopment, condemnation, and title and easement issues. While attending Seton Hall University School of Law, Mr. Messmer was an Editor of the Seton Hall Law Review. He is a member of the New Jersey State and Middlesex County Bar Associations.